Floating pool lights come in an assortment of styles and lighting sources - from solar to LED lights. Floating lights can set the mood for a great evening by the pool. You can use large swimming pool candles for a more quiet and relaxed feeling or use bright, multi-colored lights that change lights for a disco effect. Small lights look good in a hot tub or bird bath but not in a big swimming pool. Larger is usually better. The smaller the lights the more you need for impact in a large area like a pool. The larger the lights the bigger the impact. You can find these orbs in 3", 6", and 12". If you want to using floating lights for your pool, you can't just get 2-4 of them. It will look inadequate. A pool is just too big. You need LOTS of lights. 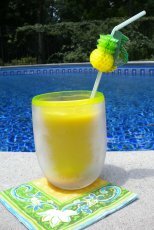 If you don't want to do that then check out some other pool party light options. 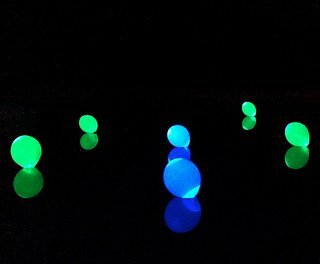 Floating pool lights will drift and bunch together . If your pool pump is on they will end up by the skimmers. So run your pump before the party and turn it off just before the guests arrive. Also try to use lights that have anchors to them - like the weighted balloons or the Solar Lotus Flowers. Your two options are solar powered or battery powered. The solar balls can run up to 6 hours on a single charge. This is a set of 12 3" orbs that features 7 colors to chose from or you can opt to have the balls transition through all of the colors. 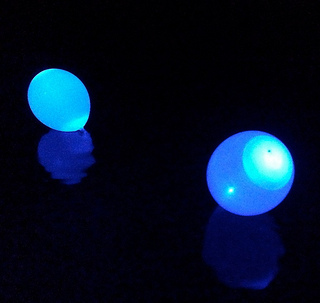 You can use these light up orbs as floating pool lights or place them along the pathway to your outdoor party. Two CR2 batteries are needed for each orb. Make sure that the battery cover is snug before placing them in the water, and to have them last longer, turn off when not in use. Do not leave them in the water when you are not using them as they may corrode. Turn your pool pump off so they don't clump together. This globe shaped solar light is 6" - I wish it was bigger but it is one of the brightest solar lights available. The price is just over $27 which is fine if you just want one. But for a large pool like ours - we would need probably six or it would look rather funny with just 2 floating out there in such a big space. Solar Floating Pool Lights - 12"
When it comes to lighting up your pool at night - size matters. The larger the better unless your pool is really small. That's why I love this 12" solar globe. 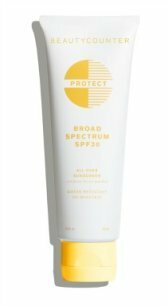 It's waterproof so it can be used in the pool, a spa, birdbath or pond. If you like color - this one has it. There are settings for red, blue and green. Set the color you want by pressing a button. Simply turn it off by holding the button. Another nice feature is that it automatically turns off after four hours. 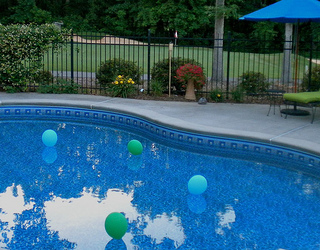 These round orb lights can be placed in the pool or anywhere around the pool area. Get the larger 9" version rather than the 3" - the 3" are too small for a swimming pool. Also - the best part is that there is a loop on the bottom to tie a clear fishing line or string. Tie the string to a couple of heavy washers from the hardware store. Place your lights where you want to and they won't move. Without being able to anchor your lights, it really isn't possible to enjoy the beauty of floating pool lights. If your lights aren't anchored - like if you want to use large floating candles - they will all bunch up. 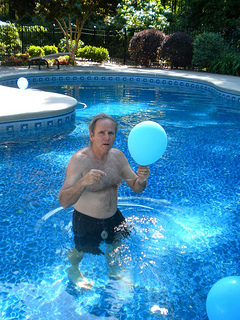 An affordable way to light up your swimming pool is to use lighted beach balls. They are nice and large providing the impact that is needed for a large space. 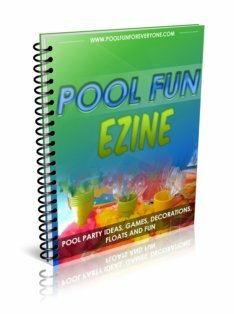 There are two ways to use lighted floating beach balls for your pool. One is with LED lights and the others utilize glow in the dark sticks. This one from Amazon uses LED lights that change from one color to another. The size is 11". There really is nothing quite as romantic or festive as floating pool candles for an evening party around the pool. Just set them out (they are water activated) at dusk and set them in the water at both ends of the pool. If you have a large pool of water be sure to select large floating candles, at least 3" in diameter and plenty of them - otherwise if you just have a few- like 3 - you won't get the effect that you desire. Also turn off your pump so that the candles don't all bunch together. We now prefer the LED lighted floating candles to real candles. So many times, the candles blow out and all that effort is for naught. LED lights stay lit for hours and aren't affected by the wind. These lights are water activated so you don't even have to turn them on. While this solar pool light sits on top of the pool it provides a disco like lighting under the water. It displays multicolored patterns of light for a party setting. There are 7 different light show options: lights flashing randomly, two speed flashing, lights fading from one to the next, random cycling through all shows, chasing lights, in a wave, and lights staying on continuously. It will run 6-8 hours on a full charge. Of course it needs to sit out in the sun to get it charged. Press the on button and put it in the swimming pool. For larger pools it would be best to have two of them. These lights work best in pools with a light colored bottom - whether it's vinyl or gunite. The light display is just not that visible in a pool with a dark liner. Light up balloons offer the same two light technologies - inserted glow sticks or LED lights. The glow sticks will last for one evening while the LED lighted ones can be used multiple times if you change the battery. 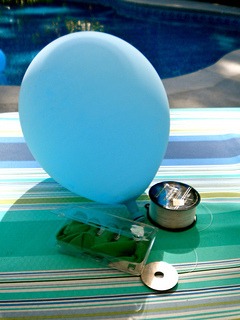 Here is how we turned the light up balloons into floating pool lights. We purchased clear string and heavy washers from the local hardware store. Go into the pool and determine how long the string should be. Longer string is needed for balloons floating in the deep end. Tie the string to the balloon and to two washers. We positioned and turned the light up balloons on just before our guests came at around 6:30 PM so that as the sun went down, the lights became evident. LED balloons offer three different light modes. There is a button at the base of the balloon: slow blink, fast blink, and steady on. These high quality balloons will stay lit for 10 hours. Extra batteries come in the package -so just replace the batteries for the next time. Balloons come in lots of different colors - white, red, blue, green, yellow and orange. I bought a set of these LED lights that can be put in water. We use them in the bottom of the ice bucket, in water vases with flowers and scatter them on the bottom of the pool. They look really great and everyone asks where we got them. So far they have lasted for hours without getting dimmer - but when they do I am getting more. A lighted pool fountain provides light as well as the soothing sound of splashing water. The lighting options are white lights or changing LED lights. Powered by the water and not electricity, fountains can be a great source of lights for night time pool parties. This one from Amazon is only $30 and provides light above and below the water. It requires 4 D batteries so there is no hooking it up to pool returns - so easy to use.